Both Army and Navy run variants of the option offense. The last three drives — all for scores, giving Navy a 10-7 edge — showed how those variations can equal points. Navy drove 66 yards in about five minutes, capped off by Noah Copeland’s 12-yard touchdown run. He ran the ball on five of nine plays, but two key gains came in the air — Keenan Reynolds hit Shawn Lynch for 19 yards early in the drive, and Matt Aiken caught a quick pass from Reynolds and muscled his way for five critical yards on a third down deep in Army territory. So, the Navy attack plan — throw just enough to keep the Black Knights honest, then turn things over to Copeland up the middle. Army’s scoring drive ended in familiar fashion, with senior Trent Steelman faking a handoff and scoring from 11 yards out. It was his 17th rushing touchdown of the season, causing more rewrites for the Army record book. The Army attack plan — plenty of inside handoffs to Larry Dixon and Raymond Maples, plus fakes of those handoffs by Steelman that can lead to big gains. No passes — heck, only one pitch — to drive 75 yards and tie things up. 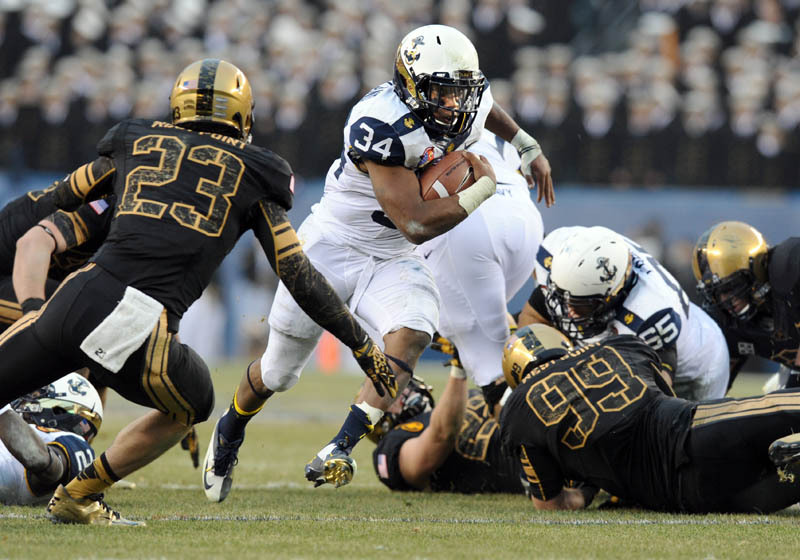 Back to Navy, and Reynolds nearly hit senior Gee Gee Greene for touchdowns twice — Green dropped a pass down the right sideline, and Nate Combs batted down a third-down throw intended for Greene, who’d beaten his defender in the end zone. A 31-yard field goal by Nick Sloan gave the Mids the lead with 25 seconds to play in the half.